Arrival Istanbul Port at 15:30 pm. Embarkation can be done after 17:00 pm to the ship. 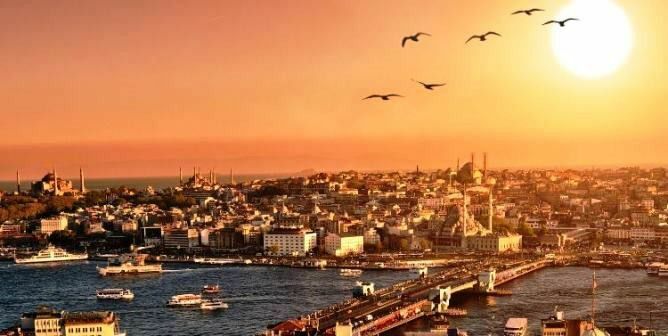 Istanbul is supremely exotic, warmly welcoming, and quite unique – after all, where else can you tour Europe and Asia on the very same afternoon? Must sees include Haghia Sophia, decorated in 30 million tiny mosaic tiles, the greatest church in Christendom for 1000 years, then a mosque and now a museum; and Topkapi, palace of sultans, complete with harem quarters. And of course shopping in the Grand Bazaar, a medieval version of a mall, for unusual gifts to take home, stopping along the way in a café for a cup of Turkish coffee or mint tea. 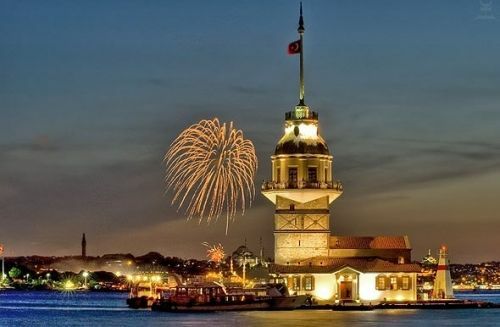 Canakkale is not only name of a city but also the province including the battelefileds and memorials of GALLIPOLI, the legendary ancient city TROY, the mystical and fascinating ancient city ASSOS, the popular historical resort island BOZACAADA, the impressive nature of MOUNT IDA. Near Volos you can see some amazing constructions: the Meteora monasteries* were built several centuries ago hundreds of metres high up on huge rock pillars. Visit the nuns and monks in their breathtaking homes, and you will be given some exclusive insights into life behind the monastery walls. Or you can take a hike on Mount Pelion*. If you prefer to travel in comfort, the 100-year old narrow-gauge railway* will take you over viaducts and through the magnificent mountain scenery. The first excavations were begun in 1878 by the Heraklian Minos Kalokairinos. A bit later (1900-1913 & 1922-1930) the excavations by the British Sir Arthur Evans were to complete the scientific research, bringing to light the Minoan palace in its entirety, which was, according to tradition, the residence of the wise King Minos.The palace of Knossos spreads around the large Central Court. You will reach the awe inspiring Throne Room, the fresco of the “Prince of the Lilies”, the imposing Grand Staircase, the Queen’s Megaron in the east.Walking through the apartments of the Knossos palace and observing the finds even as passers-by, you will feel part of this cultural heritage. 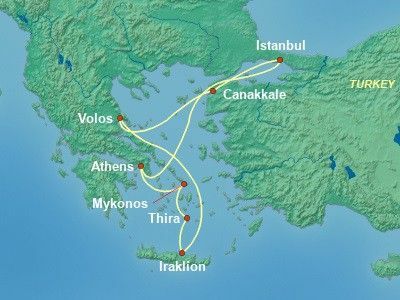 We will stop in Heraklion on the way back to the ship. Heraklion was founded in 824 and is an important homeland of many contributors to Literature and Art, some examples of which are the Nobel winning poet Odysseas Elytis, the Renaissance painter Domenikos Theotokopoulos (El Greco) and the writer Nikos Kazantzakis. 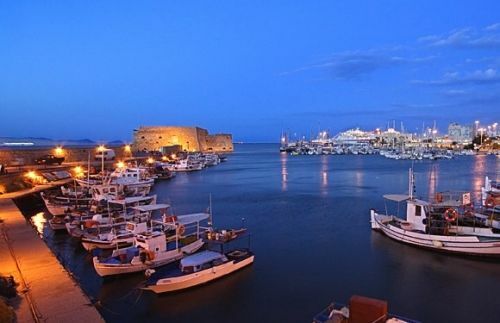 Heraklion is also endowed with some wonderful edifices: the “Koules” fortress, the award winning Venetian structure of the Loggia, the Morosini Fountain, the Basilica of Saint Mark, and the Church of Agios Titos. Starting the walk from Liberty square of Heraklion guests will pass by the shopping streets of Dedalou and 25th August and see the aforementioned sights along the way. First you head up to Megalochori village, one of the most authentic and unspoiled villages of the island with its distinctive architecture and character. We will continue on to the east, in the background, you will have settlements like Kamari and Monolithos, while you will pass through Fira, the small traditional villages of Firostefani and Imerovigli with delicate architecture and beauties, to eventually arrive at the settlement of Oia. During the entire route, to the west you will have before your eyes the lace-like caldera, the little islands of Thirasia, Palea and Nea Kameni and an unsurpassable panoramic view. In Oia you will have plenty of time to stroll through the marble-paved alleys, to gaze at the adorably cute shops, to take pictures, to become acquainted with the characteristic buildings, carved into the rocks and the unusual captains’ manors, the settlement Ammoudi at the foot of the caldera… After your curiosity has been sated of the area which is characterized as being of “exceptional natural beauty”, your return begins. - All prices are per person in Euro based on double occupancy and are lowest available. Government taxes are not included. Prices and availability are subject to change. 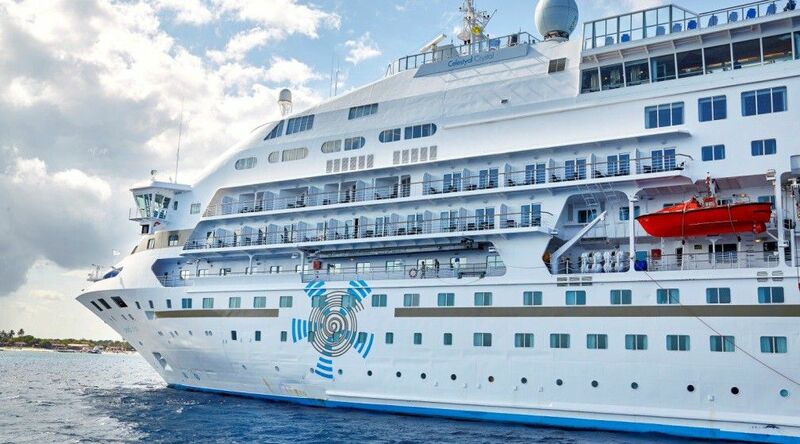 For bookings made within 14 days of sailing and during peak holiday periods, the air portion of your trip is NOT guaranteed. - Emberkation & disemberkation can be done at Pireaus Port.